For today’s post, I’d like to piggyback a little on what Tanya Lee Stone wrote last week regarding the frequently asked question, “Will the internet replace nonfiction?” Tanya’s answer to the question is “a solid and emphatic NO!” and she had many insightful, supportive arguments. But, Tanya’s article made me think more on the subject, especially how nonfiction books relate to art, creativity, and learning styles. My memorable art appreciation presentations have been when I introduced an artist by reading to the class a nonfiction picture book. One of my favorite nonfiction books is Frida by Jonah Winter. Having read the book in several elementary classrooms, I’ve always had all ears listening to every word and all eyes studying the illustrations. Then, the fun begins where we discuss what they learned from my reading of the book, which is filled with insightful observations and never boring. As Tanya points out in her INK article, “Nonfiction books, especially when done well, tell a story. Good nonfiction writers employ techniques used in fiction—point of view, narrative, perspective…the list goes on”. Art appreciation experts tell us that the real art appreciation begins with conversations about art. How does it make you feel? What do you think the artist is trying to say? Do you like this artwork, and why or why not? Simply reading biographical information about an artist from the Internet does not start these conversations. When talking to kids about creativity and inventors, I tend to focus on how and why an inventor thought up such an amazing idea. And, hopefully, later as a child plays, she too may have a glimmer of an idea. Wonder what our world might be like if Mr. Wright never bought home those toy helicopters – the self-admitted spark for Wilber and Orville. Education built on simply finding facts from the Internet supports our current educational system that bases learning on the ability to check the one correct box on a test. Reading a well-written nonfiction book to a class incorporates, in a way, of all three learning styles: visual, verbal, and tactile/kinesthetic learners. Furthermore, as we start to also ask questions, discuss feelings, and contemplate motives, that is when we begin to engage the right -brain and creative thinking. And, we all know that right-brain thinking is fundamental to the future of our children. Stepping off my soapbox now --- got my baby girl’s high school graduation to start planning for this weekend! Have a great Memorial Day weekend! Why ice dance? The curve and the swing, the energy of the dance propels each partner at times. One suggests a direction; the other mirrors, enhances, completes the curve. Let go at the wrong moment and either partner can land in the lap of the audience. So it is with my illustrators and me—even if we have never met. It happens on the page. I've been lucky to partner with some terrific illustrators. 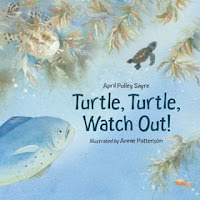 In my last INK post, I discussed the re-imagining of Turtle, Turtle, Watch Out! by illustrator Annie Patterson. So, in this post I'd like to shine the light on some more illustrators so that those studying nonfiction might see their work, as well. Because the diversity of approaches is astounding. You can see the beauty of illustration by INKers such as Roz Schanzer(http://www.rozschanzer.com) and Steve Jenkins (http://www.stevejenkinsbooks.com). by Alix Berenzy. What fascinated me about her work was her medium. She began with black paper and covered the pages with soft pastel so that the black just peeked through the illustrations. Kids love to explore this technique, this covering of dark with light instead of the conventional covering white with dark. She captures the mood of the caribou on their difficult migration. The paper glows with light as they emerge onto a rise, a meadow rich with food. The perspectives in her illustrations are wonderful. You feel the movement of the birds migrating at night, the fish leaping up streams, and especially, that river of antlers, those caribou. Her work launched my own study of illustrations, particularly those in my own books. Yet part of the story is not with the illustrators, alone. Art directors, page designers, and type designers and editors are on the team and it's often hard for me to know what each one contributed to the whole. They find opportunities where sometimes I did not see them. The pacing of a book and flow of text can make text sing—or change its rhythm entirely. So I've been lucky to work with people who cared to make these books work. I hope to highlight some of the other 24 illustrators I've partnered with in future posts for INK. I am a photographer. I have 40,000 or so photos, stretching back twenty years and covering dozens of countries and mostly wild places. So I could, and do, use those to illustrate some books. 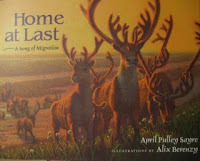 But I could never replace the beauty of what these illustrators do, particularly for young narrative nonfiction. In case you don't believe me, here is the sum total of what I can draw. As I tell children on school visits, be glad I'm not doing the drawings for my own books. Be very, very glad. I love visiting writers’ offices. I’m often amazed how tidy/untidy, large/small, isolated/communal are the spaces from which their wonderful books emerge. I’m a relatively (!) tidy person – outside my office. Remember those predictions of paperless offices that computers were supposed to bring about? Would my workspace be tidier if I wrote only fiction? I doubt it. I’ve got a small office, but it fits me like a comfortable old shoe. Bulletin board is a hodgepodge of personal and professional stuff going back years. The large butcherblock table (it weighs a ton!) was a gift from a friend who was moving cross-country. 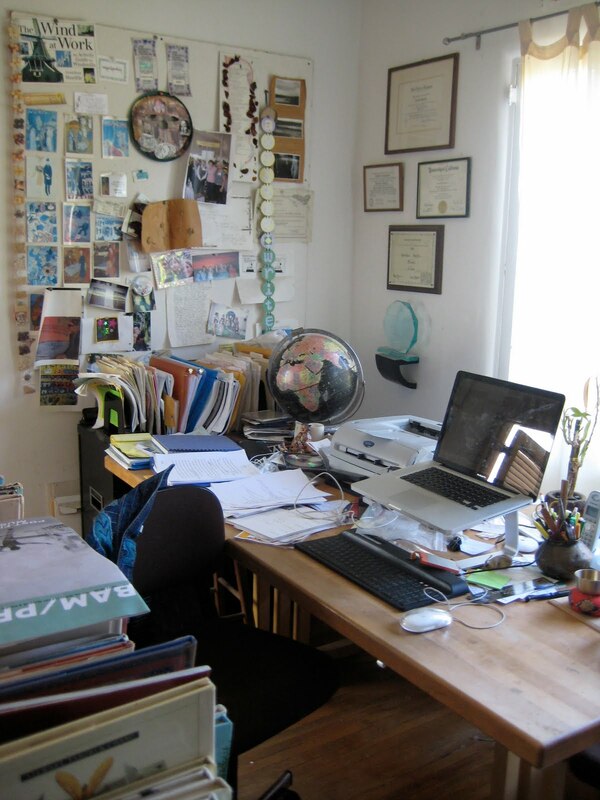 It’s perfect for a nf writer – plenty of room to spread out. My son advised me to buy those vertical folders to clear the stacks from my desk. I did, but I still have stacks. I never leave home to work. Coffee houses are much too distracting– all those people on their cell phones, the roar of the espresso machines, (usually) annoying music. 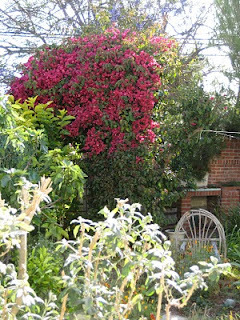 I stay in my office to write first drafts, but when I’m reading or revising, I’ll take my laptop into the garden. This small desk holds an overflow of Stuff. My wall of family pictures brings them all close. An original Tony Ross illustrated plastic poncho was bought at an ALA Conference Silent Auction. The organizers hadn’t taken it out of its nondescript little envelope, so no one knew what was inside. I was the only bidder – and the lucky winner for $10! 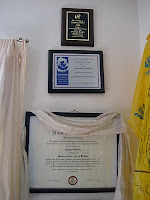 My Vermont College MFA diploma holds pride of place with some writing awards. And here's Tony Ross close-up. 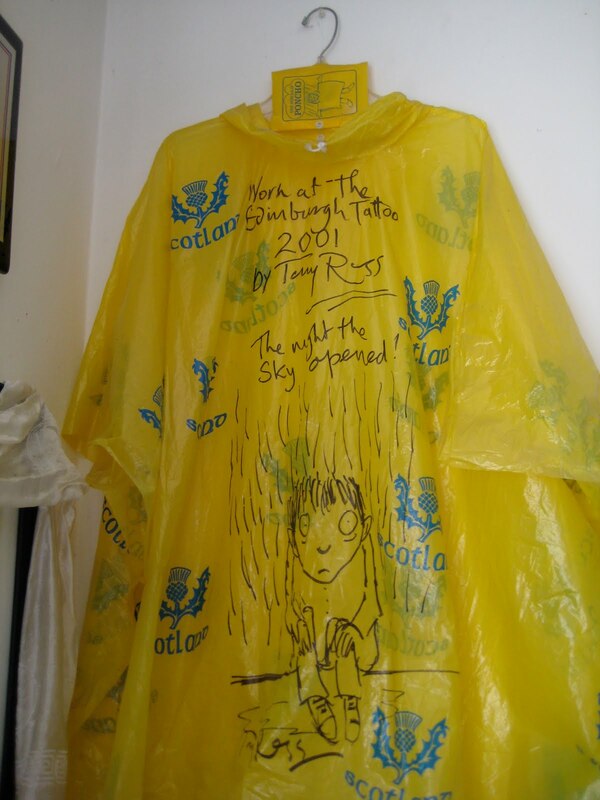 The text says "Worn at the Edinburgh Tattoo 2001 by Tony Ross. The night the sky opened!" My first book, a history of windmills, spawned a collection of windmill-related items. 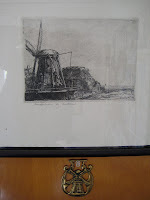 Here’s a Rembrandt print and an antique horse brass. Every office needs a cat. I’ve got two that vie for the privilege of hunkering down close by. On Friday evening, I visited my friends Tom Colton and Ellen Simms. We took a bike ride, enjoyed a dinner together, then sat in front of the fireplace to eat ice cream, drink herb tea and look at pictures on my laptop. Pictures of rotting pumpkins. I always enjoy outdoor activities and meals with Tom and Ellen but I had an ulterior motive this time. Ellen, aka Prof. Simms, is a botanist in the Department of Integrative Biology at the University of California, Berkeley. I am writing a book on what happens to the jack-o' lantern after Halloween -- a Halloween book for November, you might say. My ulterior motive is that I wanted Ellen's help in identifying some of the blotchy, fuzzy and moldy looking things growing on the pumpkin. Their portraits, captured by photographer Dwight Kuhn, were the perfect accompaniment to herb tea and ice cream. When people think of what it means for a non-fiction author to do research, they usually envision the author looking up facts in books or articles -- either in print or online. For me research involves all of that, but most of all, I like to consult experts. Whether the subject is mathematics, music or mycology (or subjects that don't begin with "m"), I get the most bang for my research buck when I sit down and talk with someone who knows what he or she's talking about -- if it is what I want to be writing about. 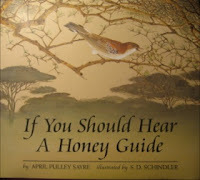 Before I started writing non-fiction book for children, I was a frequent contributor of articles to Smithsonian, National Wildlife and Audubon. Working with experts was not only essential to reporting a story, but it was more than half the fun. I spent two weeks in Tanzania with a biologist who studied communication in hippos. I went to far northern Scotland to track outlaw egg collectors with investigators from the Royal Society for the Protection of Birds. I spent time with wildlife biologists who were breeding river otters from Louisiana to reintroduce them to the species' former range in Missouri. What fine fun, what fine facts (and what a lot of frequent flyer miles)! How does a writer find these mavens? It helps to have friends in universities but there are other ways. I have looked for the names of researchers quoted in books and articles. Usually that person's university or company is mentioned, so I just look her up and call. I don't always get a call back, but I'm onto my next lead and not worrying about. The internet can really help here. Just search any topic and follow a few of the links to find the names of experts galore. I look at their publications to see if they specialize in the subject of my own research. Experts themselves are a little like websites: they usually "link" me to others. Before we had gotten past the first few pictures, Ellen had suggested I see a Berkeley colleague, mycologist Tom Bruns, in the Department of Plant and Microbial Biology. (Mycologists study fungi.) He doesn't know it, but at about the time you read this, I'll be looking up his phone number and getting ready to call. Will the Internet Replace Nonfiction Books? This is a question I am personally asked on a regular basis, as well as a question I have heard debated all over the, well, the Internet. May I just say that my answer to this question is a solid and emphatic NO! I actually had a teacher ask me this question during a school visit, in front of a room of 100+ kids. And no, he wasn’t setting me up for a teaching moment. He was serious. There are long and complicated answers as to why the Internet—with its fast-action access to loads of information and its highly touted Wikipedia—is a vastly different beast than a nonfiction book, but I’m going to focus on the short answer. Context. Is one word too short of an answer? How about: readers need context. Still not enough? Let’s try this. What the Internet provides are quick answers to straightforward questions such as, “What roles other than Rachel from Glee has Lea Michele performed?” That we can find out with the click of a mouse. But to read a whole story, which puts an episode of history or a person’s life in context for readers and includes nuance and perspective and gets into the details and nitty gritty of a subject—for that, you need writers…and the books they write. Nonfiction books, especially when done well, tell a story. Good nonfiction writers employ techniques used in fiction—point of view, narrative, perspective…the list goes on. 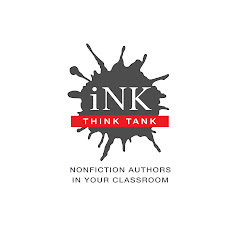 Nonfiction writers gather reams of information, digest all of it, and put a story back together for themselves and for their readers, making sense of what happened as they go. They question sources, triple and quadruple check information, put layers of information together, track down new primary source material if possible, discover missing pieces to the puzzle, and push, push, push until they have exhausted all their resources and told a story that has a narrative arc that includes the context of what was happening in the world during the place and time of the story. Writing—and reading—a great nonfiction book is NOTHING like finding information on the Internet. Nothing. I do believe that nonfiction books are alive and well. Or perhaps some of the list below exist already and I just haven’t heard of them yet? (In this ever-changing digital/virtual world, I try not to assume that a particular tool hasn’t already been created.) We authors already compile software packages and bookmarks of web sites that help us do our jobs more efficiently, custom-tailored to our interest areas or current projects. For example, lately I've been needing some Internet-related terminology and have been using NetLingo, which has several interesting options for finding terms and acronyms. Have you ever heard of a synthespian? How about a metoobie? How about a square-headed spouse? If not, browse awhile or subscribe to their word of the day and you may find yourself joining a collaboratory. So here is my wish list, and if any of these already exists, by all means let me know. The Readerator: Submit your latest draft to this online system and receive quick feedback on its quality including uniqueness, objectivity, accuracy, organization, flow, pacing, humor, and whatever other qualities you specify. 100% confidentiality is guaranteed. Of highest importance is the tactfulness of the Readerator’s response, naturally. Word Volunteer: This on-the-fly handy feature in your word processor suggests alternatives to overly used words in your manuscript. “Pardon the interruption, but you’ve used confuse twice already. Would you like to substitute baffle, perplex, or flummox? Pubalyzer: This handy service reads all existing works on your topic so you can avoid duplicating the angle of already-existing books, ebooks, etc. Reading level, type of illustrations (if any), sales figures, awards won, and many other aspects would be included. The Anachronixer: With this technology, you can avoid mentioning a song from 1962 in a story set in 1961 and other temporal glitches. The Deflattener: This search feature finds dull passages so you can liven them up with your preferred method. Adverb Alerter: Do you tend to become horrendously, heartbreakingly devoted to your wonderfully-written descriptively delicious words the moment they appear on the screen? This is great way to tone down that purple prose. At least to lavender. CommaFix: Please help me, I often have no idea where to put or not put them. Undoubtedly there are many more tools waiting to be developed, but this is a good start. By all means add your own suggestions... the programmers out there would probably enjoy a good challenge. I know I'm preaching to the choir, but I need to rant and rave about something: what the heck is going on with school districts and towns closing school libraries? How can we have schools without libraries and librarians? It's just lunacy. And public libraries, closing? I mean, what, are they kidding? Kids need libraries and librarians, adults need libraries and librarians. With most issues I can see the opposing point of view, on this one I can't. To me this issue is black and white, all or nothing: we need libraries. We need librarians. Oh, we have the internet, right? Kids can just go on the internet, they don't need books or librarians. That sound you hear is me bashing my head against the wall. When I go to schools and there is a professional librarian in a real library, those kids know the difference between fiction and non-fiction, they know about different kinds of research books, they know what the are going on web sites and on the internet, not just that they are "on the computer." I was at Mosaic Prep, a school in Harlem, last week. This is a public school, the first year the school has been in existence. The library was filled with books. It had a smart board. The librarian was dedicated, energetic, and kind. She told me she had had an author in just about every month of that year. AND when I asked the tiniest kids, the kindergartners, what non-fiction was, they all raised their hands. And they knew. When I go to a school where they have cut the librarian position, and the teachers are overworked teaching to the test... yes, you can fill in the rest. We all can. No, not all of us. All of us reading this blog. But not all of us in this great country of ours. And I do mean great. We are great. Our kids are great. They all deserve the best. And that means libraries and librarians. We don't have to bash our heads against the wall. We can speak out. We should speak out. We have to raise our voices and stand on our soap boxes and use our pens (aka computers) to persuade the Powers that Be to keep our libraries open and staffed with librarians (or media specialists; I don't care what their title is, we know who they are). My friend Laurie Halse Anderson spent last month making public service announcements as spokesperson for the American Association of School Librarians. Please visit their web page, watch her video, and pass it around. We need to start speaking up about this, loudly, and frequently. Among other great things Laurie says is that "every child needs an amazing library staffed with an incredible librarian." And she quotes Ben Franklin: "The only thing that is more expensive than education is ignorance." She says if we keep closing libraries, we will have to build more jails. Gives me chills. Laurie and AASL are not the only ones who are speaking up about libraries. Teachers, writers, librarians, and parents are speaking up around the country. We need to join in. Even my favorite NPR show, Wait, Wait, Don't Tell Me, had a segment about libraries on its show this week. For a lighter (but ultimately serious) take on what people are doing to help libraries, listen to the segment, or read the transcript of their "Bluff the Listener," segment here. This post is self-serving in one way: we childrens' non-fiction authors need the gatekeepers more than perhaps anyone else. Librarians and teachers are the ones who put our books into the hands of children more often than not. But it's not just as an author that I write this. I am writing this as a parent who more than once a week to the library with my children, as a parent whose kids' school librarian was incredibly influential in their lives, and as, I hope, a future grandparent, who will take my grandchildren to the public library, and listen to them tell me what great books their school librarian gave them. I write this post as a member of our society. I am with Ben Franklin and Laurie: let's keep the libraries open so we don't have to build more jails. In any case, I got to thinking of Dolley Madison. Why? Well, had she not died back in July of 1849 – Imagine: This lady who'd had tea with Martha Washington lived to see the era of the steam locomotive and the Gold Rush! – Mrs. Madison would be turning 242 years old this coming Thursday. And in the last few months I wrote a book about her (Would that someone would publish it! ), in part, wanting to write about her husband and their remarkable era. I was so taken with Dolley's gumption (except when it came to her horrid son from her 1st marriage, to a young Philadelphia lawyer who died of yellow fever in 1793) and her gaiety. A gifted politician and social networker she was, in her way of bringing people together, encouraging conversation between political adversaries. Sure Martha was the first, and Abigail the first to live in the big stone house, but really, Dolley Payne Madison was the first to embody the role of First Lady. I needed an expert on cat vision. Off I went to the web and found perhaps THE expert on cat vision—and rattlesnake vision, for that matter. Instead of the typical preliminary, “I’m a children’s book author writing…” email, I impulsively called the neurobiology department of his university and got put through. When this guy, who spends his days teaching people about the human eye and colorblindness, heard I actually wanted to talk about cats (and rattlesnakes, for that matter), he was thrilled. This is my life’s work, he said, and I rarely get to talk about it with anybody who’s really interested. Well, finding people like him is MY life’s work and one of the best things about my job. I start learning about a new topic and after the general stuff, I want more. I want the facts that make the subject sparkle. I want to instantly gain the perspective that takes years of thought and study to develop. And I know that lonely expert can give it to me, if only I can find him or her. We all love to talk about our work, what occupies us for so many hours each day. Doubtless we love to share it more than others love to listen. But when my expert started in on nanometers and photoreceptors, I was as passionately interested in hearing what he had to say as he was in telling me. It was, as they say, the beginnng of a beautiful (although temporary!) relationship. We recently moved to Portland, Oregon, from a four-bedroom house in California with a big backyard, to a two-bedroom condo right downtown. Since we’re on the ground floor, our tiny balcony feels more like a back porch—it even has a gate that opens up into a condo courtyard with trees, bushes, flowers, and birds. Condo living is full of rules, we’ve come to discover. This is not surprising, seeing as how a lot of families have to share the same close quarters. But as I flipped through the fat binder of condo rules, one in particular caught my eye: unaccompanied pets are not allowed in the courtyard. The thinking behind this rule is clear—we all chip in to pay for landscaping, after all, and no one wants their view spoiled by damage done by a neighbor’s pet. So when we moved here, I resigned myself to the idea that our big old bull of a cat, Apollo (13 years old, 13 pounds and growing! 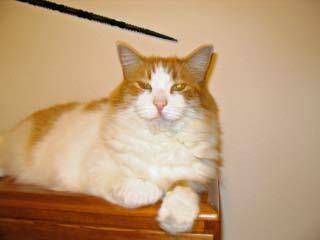 ), would have to become an indoor cat. No more prowling the grounds, sniffing the air and surveying his domain, as he had done in our old backyard. He would have to be king of the forest through a glass window pane. The cat was not pleased about this new arrangement, and in the four months we’ve lived here, I’ve watched him grow less and less interested in looking out the window, less playful in general, in fact, and more likely to sleep the day away. Granted, he is getting older, but it seemed like he was aging awfully fast. I felt terrible about this. And so, my husband and I revisited the condo rules and decided that it was the concept of ‘unaccompanied’ that was the sticking point. If my lovely neighbor Laura could walk her cute King Charles Spaniel (named Charlie!) through the courtyard—on a leash—couldn’t I sit on my balcony with a cup of tea in the morning and let my cat outside? I decided that I could. The cat has been sniffing. Exploring. He is just thin enough (barely!) that he can squeeze under the gate and sit beneath a shrub. I wasn’t surprised that he’d like our new routine, but what has surprised me is his sudden interest in once more looking out the window. He is king of his domain now and needs to keep a close eye on it. As fascinating as it is to read about other people’s pets, this post does actually relate to nonfiction books for kids. The world outside the window held very little interest to Apollo until he experienced it for himself—until he could sniff the moist ground, feel the breeze, and hear and see (but hopefully not taste) the birds. When we want kids to get interested in the world outside their classroom, sharing well-written nonfiction books can help. Textbooks may provide the dry facts necessary to pass a test, but a good nonfiction book can engage the senses and the imagination (and still provide the facts to pass the test!) Nonfiction books can make the world come alive. If you’re a teacher, display nonfiction in your classroom. Reinforce the idea of reading nonfiction for pleasure—the simple pleasure of learning something new. If you’re a librarian, include nonfiction books at story time. ‘Book talk’ longer titles. If you’re a parent, grandparent, aunt, uncle, or even a second cousin, consider nonfiction books when choosing a gift for a young person. And if you’re on my condo board, please don’t make me put my cat on a leash. When I was in high school, I took all the standard English courses. In college, I took quite a few literature courses that involved reading great books and writing papers about them. And then I went to journalism school and learned a whole new kind of writing. In traditional journalism, paragraphs are short and succinct. Quotations from experts cement the story together. The beginning is critical. It must grab the reader’s attention. But the ending doesn’t really matter too much. There’s a good chance it will get cut at page make up. And even if it doesn’t, most people never read that far. To this day, I still have trouble with endings. Newspaper writing is about being fast and thorough, about getting both sides of a story. And above all else, it’s about being accurate. If we misspelled a person’s name or the name of an organization or company, we got an automatic F.
A few of the classes I took in grad school focused on feature writing. Features are the longer, more in-depth pieces that run in a newspaper’s Sunday magazine section and in most monthly publications. They take longer to research and write, and they may include some creative elements, such as a scene-setting introduction or occasional wordplay. I loved writing features, and the instructor told me I had a good ear for language. She wasn’t the first person to say that. Teachers had told me that all through school, but I never really knew what they meant. I did ask a couple of times, but their explanations didn’t help much. Finally, when I joined a Society of Children’s Book Writers and Illustrators (SCBWI) critique group in 2001, I met a poet named Susan Richmond. She made the same comment, and I asked the same question. But Susan’s answer wasn’t the same at all. What she did was remarkable. She took the time to deconstruct a piece of my writing and show me exactly what she meant. Even though I was unconscious of it, my brain was often making very deliberate word choices. As a result, some sections of my prose were a bit lyrical. A whole new world opened up to me as Susan explained that certain combinations of sounds and syllables are especially pleasing to the ear—it’s a matter of physics. Susan thought that if I paid more attention to word choice, my writing would become even more lyrical. And so I did. And so it has. Now, when I go to schools and talk to kids about writing. I tell them to pay close attention to the words and phrases they string together. The truth is every word counts. "I wish everyone who is cynical about America could be here today. This is fantastic." These words were said by someone who attended the recent graduation ceremony for the adult ESL (English as a Second Language) program I volunteer with in Alexandria, Virginia. The classes begin with level A (for beginners) and go up to level G. I teach level D-2. This semester my students came from Ethiopia, Eritrea, Morocco, Honduras, El Salvador, Taiwan, Thailand, Mexico, South Korea, Sudan, Pakistan, Peru, and Jordan. All came to America in search of a better life and a brighter future for themselves and their children. They are diligent, dedicated, motivated, friendly, supportive and kind. Getting to know these courageous men and women has enriched my life immeasurably, and I am very proud of their accomplishments--including mastering the present perfect tense! So in honor of Aisha, Helen, Sara, Pranee, Erik, Vilma, Hsiang-chi, and the others--and in light of the current debate about U.S. immigration policy--I am highlighting nonfiction kids' books about the immigrant experience in the U.S. Here are a few I came across at my local library and bookstore. If you have other titles to recommend, please share them! This "True Book" offers a matter-of-fact explanation of the immigration process in the United States, from applying for an immigration visa to obtaining a green card to becoming a U.S. citizen. This chronicle of the American dream focuses on immigrant life in the tenement houses of the Lower East Side of New York City. This picture book explores the evolving history of immigration to America--beginning thousands of years ago--and explains the richness and diversity of the American people, past and present. An oldie but a goodie, this photo essay explores the lives of the sons and daughters of poor European immigrants who came to America almost a century ago. Next Thursday, May 13, is Frankie Nelson’s birthday. I discovered Frankie recently, while doing research for my book on how the bicycle changed women’s lives in the 1890s, and I liked her immediately. She was one of the original female bicycle racers, a crack, or scorcher, in the vernacular of the times. First on a high-wheeler and then on the more familiar safety—similar to our bikes today—she raced men and women on indoor tracks for minutes or hours or days on end. She even went up against two men on roller skates, beating them handily. Frankie was born in 1869. I’m not sure when she died because articles about her seem to have stopped with the end of her racing career. In fact, biographical material on her is pretty sketchy all the way around. One newspaper piece identified her as having been born in Cincinnati, but others have her coming from Brooklyn, which seems to fit her working class style and tenacity—no offense to that great city in Ohio. She very well could have moved to Brooklyn as her cycling career took off because it was one of the centers of cycling in general and women’s cycling in particular. I have yet to find a photograph of Frankie, either, although I did come across this sketch from the May 3, 1891, issue of the St. Paul Daily Globe. It was part of the Globe’s excellent coverage of a six-day women’s race in Minneapolis, in which Frankie and five other athletes rode three hours a night on six consecutive days to determine the women’s 18-hour champion. Frankie led the race wire-to-wire, traveling a total of 264 miles and 2 laps, a new women’s record. Along the way, she received a basket of roses from the Normanna Skating society in honor of her Nordic heritage. I haven't yet found references to any other prizes or cash rewards that came with her victory. Organized women’s sports was in its infancy in the 1890s, and participants often were looked at with a mixture of suspicion and disdain. Indeed, the League of American Wheelmen, the powerful body that fought for the rights of cyclists at the time, refused to sanction any racing event featuring a contest that was open to females. But Frankie and other women whose competitive spirits were awakened by the roar of the crowd and the thrill of the chase rode on, setting records and breaking barriers for the female athletes who came after them. Not surprising, Frankie Nelson’s name doesn’t appear on lists of famous people who share May 13 as a birthday, which includes Stephen Colbert, Stevie Wonder, George Lucas, Bea Arthur, and boxing champ Joe Louis. But it should. As another one of those born on May 13, I welcome her to the club. The readers and writers of this blog understand our mission: to get kids to learn the material taught in their curricula by reading interesting, well-written books on the various topics. Simple idea, right? There’s a larger mission out there: to get kids to read, period. Again, our answer is to give them interesting and entertaining books to read and show that fiction doesn’t have a lock on reader appeal. Another simple idea that we each reiterate in blog after blog, book after book. The world doesn’t yet get it. If it had, we authors would all be making decent, secure livings. Some of the impediments come from the vested interests of textbook publishers who have a political stronghold on classroom reading via the factory mentality of education—feed kids all the same gozintas to produce standardized-testing gozoutas. (How’s that working for us?) Another comes from harried, overworked and frightened teachers who have no time to invest in learning about alternative reading materials and believe that their job security depends on sticking with the prescribed books. Still another comes from frustrated school librarians who don’t have enough administrative support to help them work with teachers. Jay Gabler, who did his doctoral dissertation at Harvard on a " Social History of Children's Literature" gives us authors credit, along with progressive publishers, for the dramatic and welcome changes in children's nonfiction literature. He says, "It's important to note, though, that my time frame is on the order of decades,such changes don't occur overnight, but one book at a time. Authors and critics, it seems, have long been on the forward edge of the progressive movement in children's literature (as in literature generally) with publishers and the audience catching up over time"
Jay’s observations seem to be confirmed by a recent royalty statement. 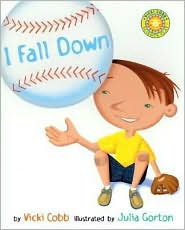 Much to my delight I discover that in the last royalty period thousands of copies of each title in the Science Play series were sold instead of hundreds and the winning title was I Fall Down about gravity, not the big award-winner about wind. The sales increase is due to some special sales but hey, now a lot more kids will be exposed to these books and maybe word of mouth will kick in. Something is cooking out there in the universe. The way the world changes requires a slow, sometimes glacial, accumulation of various incarnations of a concept, book by book, blog by blog, decade by decade until there is a critical mass. Suddenly the light dawns and it seems that change is overnight. As we wait for the world to see the light, I’m hoping that perhaps we are now catching a few glimmers on the horizon. Not to get overly excited whilst writing a blog or anything, but I had a wonderful time on Sunday doing something I’ve never done before and will never get to do again in this lifetime. Nope, I didn’t go hang gliding in the Andes. No, I didn’t pilot a kayak through whitewater rapids or win the lottery either. This was something far more ordinary; it just wasn’t ordinary for me. Not to give away my age or anything, but I am delighted to report that I went to a baby shower for my soon-to-be first grandchild. I am thrilled!!! I am also prepared. I know, I know, you can never be truly prepared for anything, but I pretty much know a zillion ways to entertain, delight, excite, amaze, inform, tempt, and thoroughly enjoy just about any kid on the planet, and especially this one. Besides, not to brag or anything, but I already have all the books. So what does all of that have to do with my grandchild? Surely I’m thinking way too hard about things that range from the sublime to the ridiculous, but both the baby shower and the lecture made me think about where humankind has been so far and where it’s going next. What does the future hold for my grandchild and succeeding generations on this ever-changing planet? How will we marathon runners adapt or even survive if there are, say, too many dead bodies of water filled with oil or too many volcanoes interrupting airplanes and satellite communication? Can the nonfiction writers among us help inspire future generations to Save the Earth they will inhabit? And where will my son and daughter in-law put all those amazing presents? I can’t wait to meet this baby, whoever it is!! From Jan Greenberg: Ballet for Martha: Making Appalachian Spring (with Sandra Jordan) will debut October 2010 with the St. Louis Symphony Orchestra. Tanya Lee Stone's Almost Astronauts: 13 Women Who Dared to Dream has been given a Jane Addams Children's Book Honor Award. The award is given to books that "effectively promote the cause of peace, social justice, world community, and the equality of the sexes and all races." fuels, solar, wind, hydropower, geothermal, and biofuels.